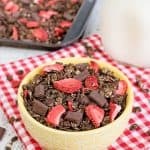 A batch of this Raspberry Chocolate Chip Granola is delicious and made with ingredients you may already have in your pantry. Homemade granola is easy to to customize based on your tastes and what you have available. 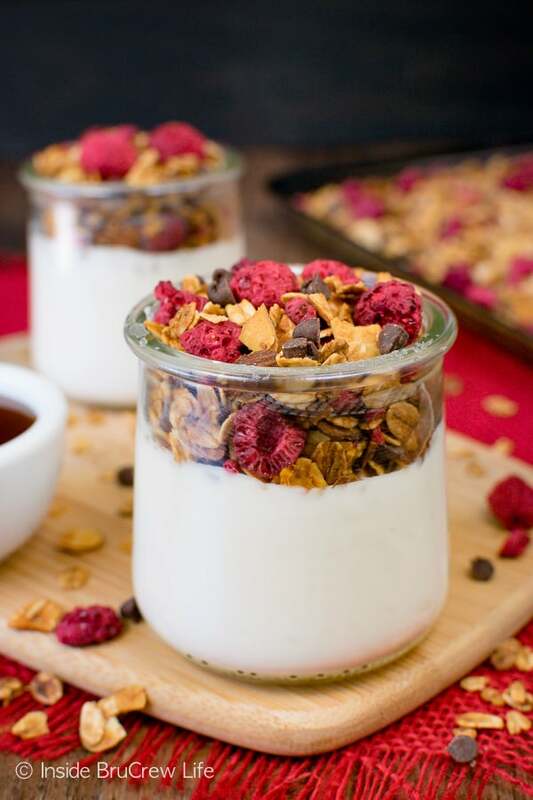 This crunchy granola is perfect for enjoying with milk or on top of these Healthy Strawberry Yogurt Parfaits. 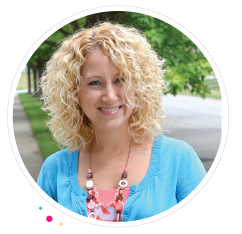 Our kids go through eating phases each month. Last month all they wanted were Cappuccino Chip Granola Bars to grab on the way out the door for breakfast and lunch. This month they are on a big salad kick for their lunch. Trust me. I’m not complaining at all. I love that our kids eat their greens. The jar of granola bars is feeling a little lonely though. One of these days, I’m sure they will be back to grabbing a few to snack on. At the moment though our daughter’s favorite after school snack is homemade granola or Peanut Butter Banana Ice Cream. She is always “starving” the minute she walks through the door after school. For the record, she does leave the house early and eats lunch at 10:30. I would be starving by the afternoon too. The fridge is pretty much fair game to her when she gets home. We try to always have fresh veggies and fruit available for the snack monsters, but at the moment she is all about granola. Usually I just grab a bag at the store for her to eat, but a few weeks ago I forgot to pick one up. Then I remembered that I bake for a living, so making a quick batch was no problem because we had all the ingredients in the house. After a quick search of the pantry I found bags of chocolate chips, freeze dried raspberries, and almonds. 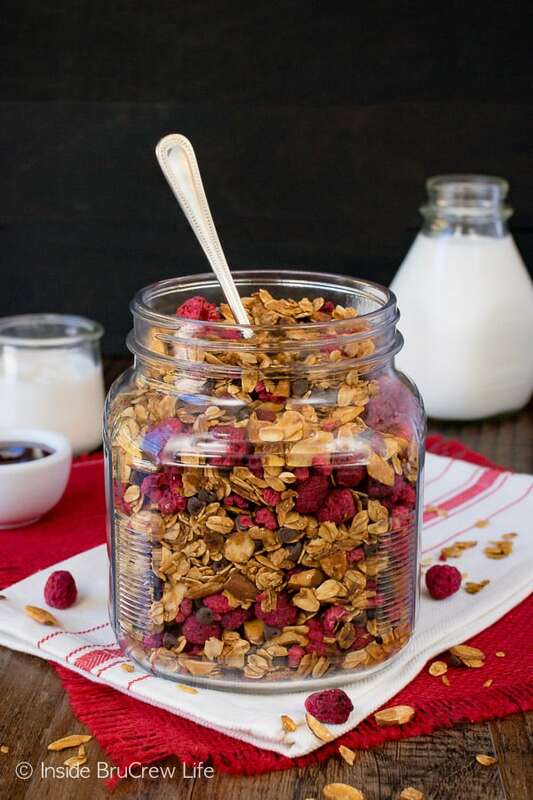 In a little more than an hour, we had a batch of this Raspberry Chocolate Chip Granola in a jar just waiting to be munched on. Granola is so easy to make, and we are already plotting out more flavor combos to try next. 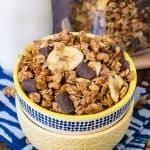 What is granola made of? Most granola starts with a base of oats. 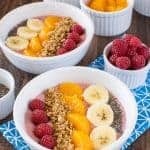 I like to use old fashioned oats for recipes like this. Nuts add crunch and protein to your snack mix. You can use whatever nut you prefer or already have. Honey and coconut oil create a glue that holds the mixture together and that helps it to bake up crispy and brown. 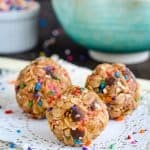 Dried fruits and chocolate add more crunch and flavor. These get added to the granola after it is baked and cooled. Feel free to use your favorite dried fruit in place of the freeze dried raspberries. Craisins or dried cherries would be great in this too. Extra flavor comes from extracts and spices. For this particular recipe, I used cinnamon and vanilla. You could change that up by using nutmeg, allspice, or pumpkin spice depending on the season. Start by mixing together the honey, coconut oil, and vanilla. Pour this over the oats, nuts, and cinnamon and stir until everything is coated. Dump the mixture onto a rimmed baking sheet that is lined with parchment paper or a Silpat. Bake it at a low temperature for about 45 minutes, stirring every 15 minutes. Stirring helps to keep the outside oats from burning and lets everything brown evenly. 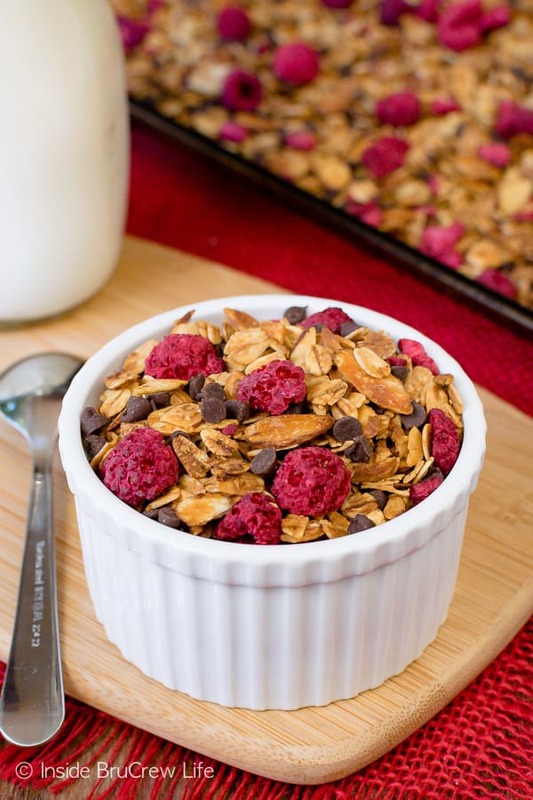 When it is done, let the granola cool on the pan completely before stirring in the freeze dried raspberries and mini chocolate chips. 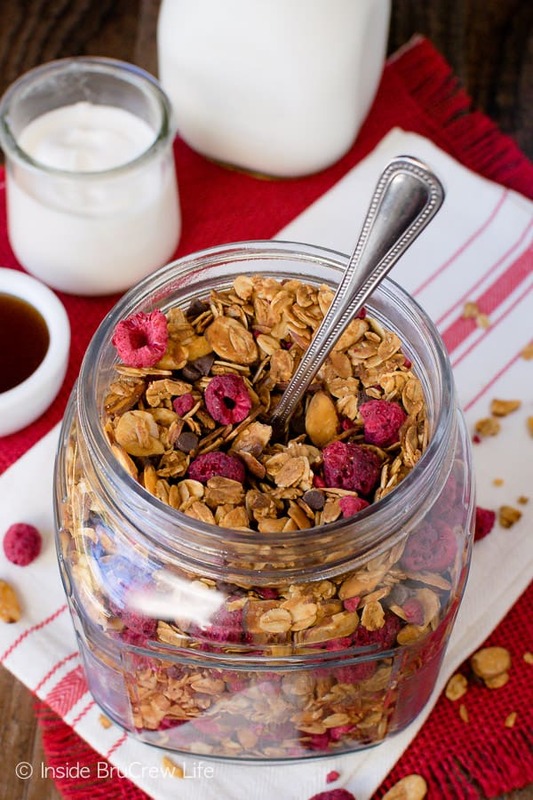 Store the granola in a tightly sealed container for up to two weeks. Although let’s be honest. It isn’t going to last that long once you start munching on it. 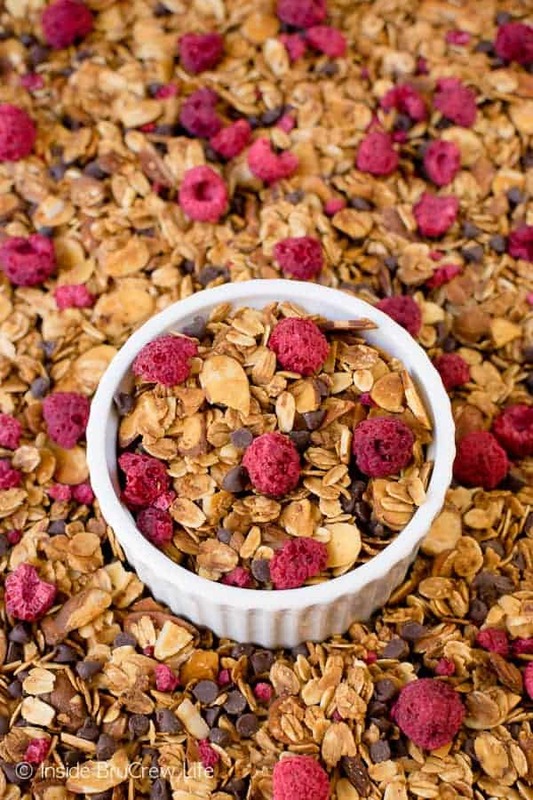 Make sure to head over to Food Fanatic to print this Raspberry Chocolate Chip Granola recipe. 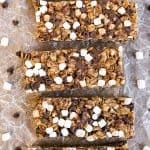 These Quinoa Breakfast Bars from Well Plated look amazing. I love the big juicy berries in them. 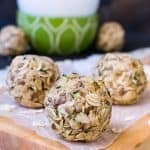 Keep a batch of these Blueberry Coconut Granola Bites from Inside BruCrew Life in your kitchen for breakfast or after school snacks. Look at all the fresh fruit on this Breakfast Fruit and Yogurt Pizza from Oh Sweet Basil. 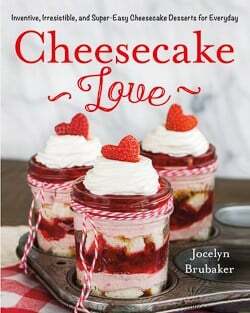 This would be gorgeous for Mother’s day brunch. A batch of these Blueberry Breakfast Parfait Pops from Mom on Time Out would be the perfect grab and go breakfast this summer. Yeah…it only lasted about 2 days here! LOL!